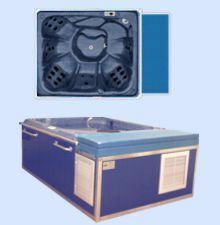 Polarzone has effectively addressed the control of infectious disease pathogens, including MRSA & VRE, in its hydrotherapy systems. Standard in all our hydrotherapy spas and systems! Bromine is an important chemical routinely used to kill bacteria and other microbes. Automated Bromine Infusion is standard in every Polarzone Spa or Pool. Ultraviolet (UV) radiation is an effective virus and bacteria killer. UV sterilization is used in municipal water treatment plants and in industry. 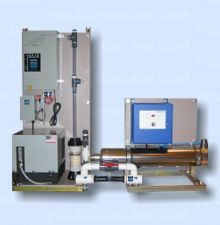 Now affordable, UV sterilization has found its way to smaller applications like your Polarzone spa. Learn more about UV disinfection. Click here for full item description and specifications. In every Polarzone spa, carefully calculated flow rates create a continuous exposure of water to the cleansing mechanisms of the system. Circulation flow, specific to each spa, insures optimum sanitation. This easy to maintain system effectively sterilizes the water and instantly kills the “bad bugs” including MRSA & VRE. The Spa water is continuously clean and safe for your athletes and staff! 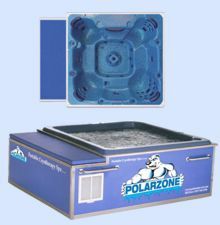 Polarzone has extensively researched and developed this effective multi-layered sanitation system which comes STANDARD in each Polarzone spa. We are leaders in the control of infectious disease in hydrotherapy systems and are committed to providing you with modalities that exceed your expectations. Triple Hurdle Sanitation System™ eliminates MRSA, VRE & other infectious pathogens! Disclaimer: Polarzone NW LLC. shall not be held responsible for the transmission of any infectious diseases or infections traced to the use of any and all Polarzone NW LLC products. Answering the needs of our customers, Polarzone can now provide Stainless Steel and Fiberglass pools and spas in nearly any configuration, size and application – hot, warm or cold. Permanent in-ground installation or above ground, all designs come complete with our exclusive Triple Hurdle Sanitation System™, safeguarding users from infectious diseases. Polarzone pools and Spas are proudly made in the USA! Click & Listen to the PBS NewsHour audio podcast on MRSA with attention to the sports industry. Click here for information on a preowned early model Polarzone Pro cryotherapy spa. This modality will be custom manufactured with your team colors & logos. It will be up dated with current equipment for a significant discount and very comprehensive warranty. HURRY! This deal will go fast!